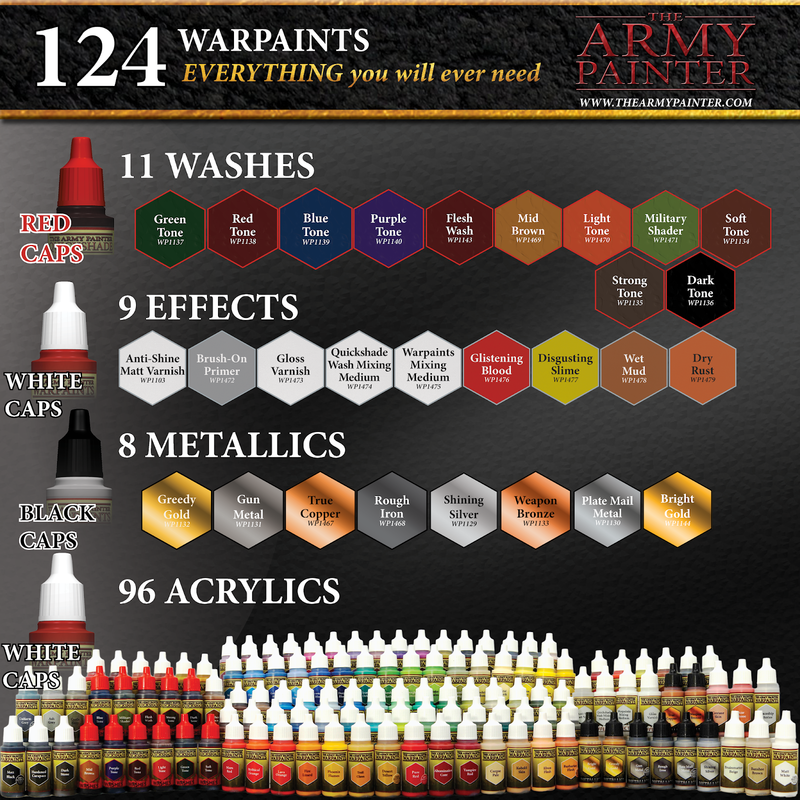 Here we go, part two of our epic review of The Army Painter's Warpaints range, the most extensive Warpaints review on the web! 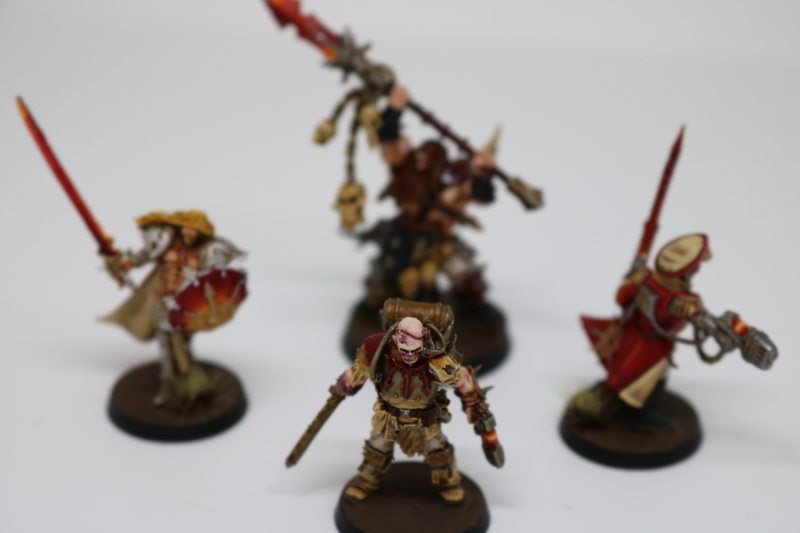 In part one, we took a look at each of their 96 acrylic paints, this time, we see how their metallics, Quickshade Inks and effect paints compete. Brace yourselves for another long post. We've run down the basics of the Warpaints paint range in part one, so check it out if you haven't already. This time, we cover the washes, effect paints and metallics that compliment their 96 acrylic paints. 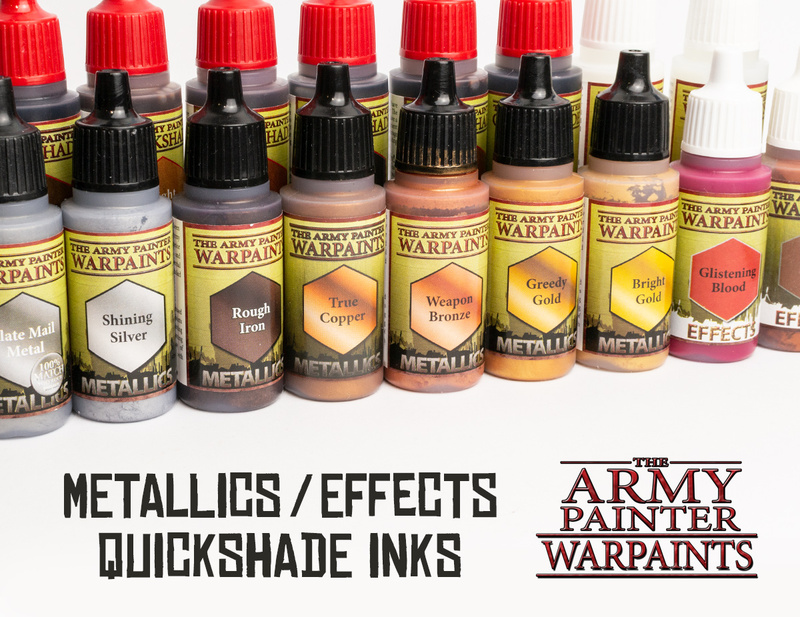 The Army Painter's Quickshade Inks are supposedly made by the same supplier who provided the washes for the former Citadel paint range. They come in bottles of 18 ml at 2.75 €/£2.25 (0.153 €/£0.125 per ml), so are almost half the price of Citadel Shades (0.153 € per ml compared to 0.263 € per ml for Citadel)! I was pleased to hear that The Army Painter expanded their Quickshade Inks with four new hues, bringing the range to 11 washes in total. The new additions are Flesh Wash, Mid Brown, Light Tone and Military Shader. Military Shader: This is a drab green wash. Compared to GW Althonian Camoshade, it's less yellowish. I like it quite much, I think it's great for shading drab or muted greens when you don't want that yellowish hue of Althonian Camoshade. Green Tone, Purple Tone, Blue Tone: We already reviewed these inks a while a go, check out the review here. 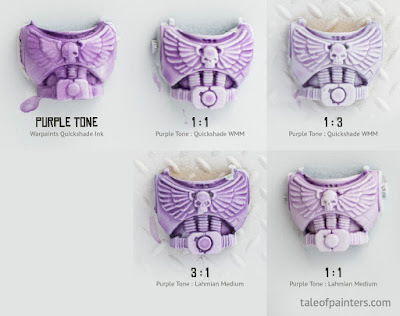 For reference, Green Tone Ink is slightly more muted than GW Biel-Tan Green, Purple Tone is a very close match to GW Druchii Violet, Blue Tone is slightly less blackish and than GW Drakenhof Nightshade. Soft Tone – Soft Tone Ink used to be quite similar to GW's old Gryphonne Sepia or new Seraphim Sepia Shade, but The Army Painter seems to have changed it into a more mid-brown wash, as seen as on the colour swatch. It's actually quite similar to GW Agrax Earthshade. Old Soft Tone Ink seems now to be Light Tone Ink. Note: Dark Tone, Strong Tone and Soft Tone are supposed to match The Army Painter's Quickshade "dip" range, though I can' comment on that as I don't have their dips for comparison. Red Tone: Already reviewed a while ago. Flesh Wash: A reddish brown wash for shading caucasian flesh, also useful for shading gold and copper. Compared to Reikland Fleshshade, it's a nuance less reddish and it settles better in the recesses. Mid Brown: This was quite a surprise, as it's an even more reddish brown wash than Flesh Wash. It's much more reddish than it appears on the colour swatch. It's actually pretty close to GW Reikland Fleshshade. Compared to other Quickshade Inks, it didn't settle quite as nicely in the recesses. Maybe my bottle wasn't properly mixed. Light Tone: Light Tone is a sepia brown, similar to GW Seraphim Sepia. 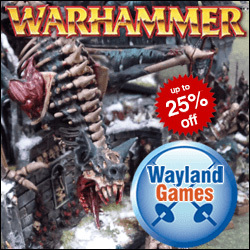 The Effect paints range features a mix of usefull additives and varnishes, as well some specially formulated paints to create special effects like blood, slime and weathering. Let's take a closer look. Brush-On Primer: A medium grey paint that can be applied as a primer over bare metal and plastic. The consistency of the primer is nice, it goes smoothly on models and doesn't drip off like some thinner brush-on primers. The durability can't match a spray primer of course. Glistening Blood, Wet Mud, Disgusting Slime: These are essentially glossy paints, made to stand out after a coat of matt varnish for a wet effect. The colours are quite vibrant, I especially like Disgusting Slime. I recommend applying these paints with a sponge or by flicking them from your brush for cool splatter effects. Compared to GW Blood for the Blood Good or Nurgle's Rot, the consistency is more like regular paint (you can find out more about Citadel Technical paints here). If you prefer a more "gooey" consistency, I recommend adding some Warpaints Mixing Medium but not mixing paint and medium properly for a similar. Dry Rust: A rusty orange with a hint of brown. Unlike GW's Ryza Rust, the consistency is similar to regular acrylic (War)paints with a matt finish. Can be mixed with Quickshade Wash Mixing Medium and applied as a wash, or used for drybrushing or stippling. Anti-Shine Matt Varnish: A very nice water-based matt varnish that can be applied with a brush or an airbrush. 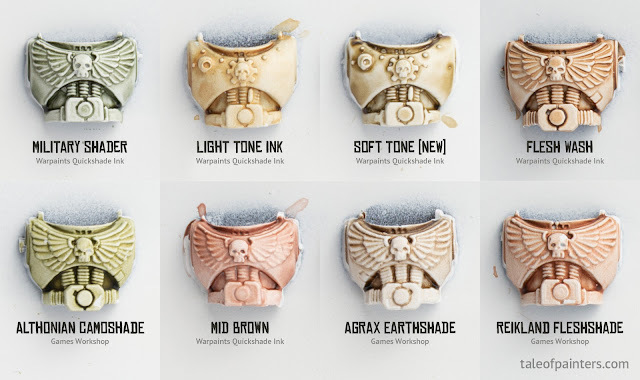 The finish is similar to the natural finish of most hobby paints like Warpaints or Citadel paints, and slightly more matt as more satin finish paints like Vallejo Game Colour or Privateer Press. It doesn't dull your colours. I recommend thin coats as the drying time will increase for thicker applications. Fortunately, the varnish doesn't frost even when you accidentally put on too much varnish. The varnish is also fully transparent and doesn't tint or yellow your paint job. Quickshade Wash Mixing Medium: A transparent fluid designed to dilute Quickshade Washes (or Citadel Shades) without changing the flow, making the wash more translucent and helping to settle the pigments better in the recesses. As you can see, I made some experiments how this mixing medium changes the properties of a wash. 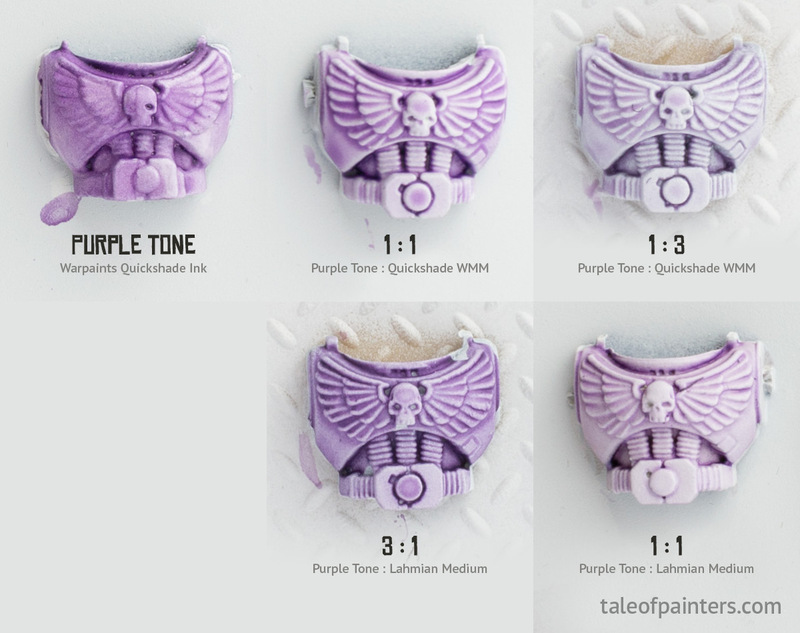 Here you can see Purple Tone wash straight from the bottle compared to several mixes with GW Lahmian Medium and Quickshade Wash Mixing Medium in different ratios. Compared to GW's Lahmian Medium, QWMM has more "body" and is a bit thicker, you'll need more of it to thin down your wash (or less wash, depending on the point of view). You can see that QWMM reduces the staining of flat surfaces slightly better than Lahmian Medium does, but it makes the wash also a bit paler. Lahmian Medium makes the wash more transparent in general, and there is more staining. Both mediums have their merits, personally I think I like the QWMM slightly better. If you use Lahmian Medium often, I recommend trying out QWMM and see if you might like it better. Warpaints Mixing Medium: Another transparent fluid, this medium is for thinning and diluting acrylic paints without changing the flow. It makes your paints more transparent. It's basically paint without pigments. Perfect when building up highlights for blending layers. Gloss Varnish: A water-based gloss varnish that can be applied with a brush or an airbrush. Perfect for adding a wet or gloss effect to specific spots like gems, tongues, mouths, acid and so on. The varnish is completely transparent and doesn't tint your paint job (there are some varnishes out there which have a slight yellowish tint). The Warpaints range features 8 metallic paints. Like most other miniature paint ranges, The Army Painter's metallics are water-based and non-toxic. The paints require a little bit of shaking, but they don't separate as badly as some of the Citadel metallic paints. The metallic pigments in the gold and copper paints are very fine, while the silvers have slightly grainier pigments, similar to Citadel silver paints. Bright Gold: A light to medium gold, lighter and more yellowish than on the paint swatch. Quite similar to GW Auric Armour Gold. It's not as thin as some other gold paints on the market and covers in about three thin coats. Greedy Gold: A medium gold with a hint of orange. Very similar to GW Gehenna's Gold, coverage is not too bad for gold paint, but not as good as GW's Retributor Armour. True Copper: Despite the name, I found it to be actually more of a brassy paint, similar to GW Balthasar Gold but lighter. More brownish and muted than on the paint swatch. Weapon Bronze: A bright and vibrant bronze paint that with mediocre coverage. Similar to GW Brass Scorpion, but slightly lighter. Lighter in real life than on the colour swatch. 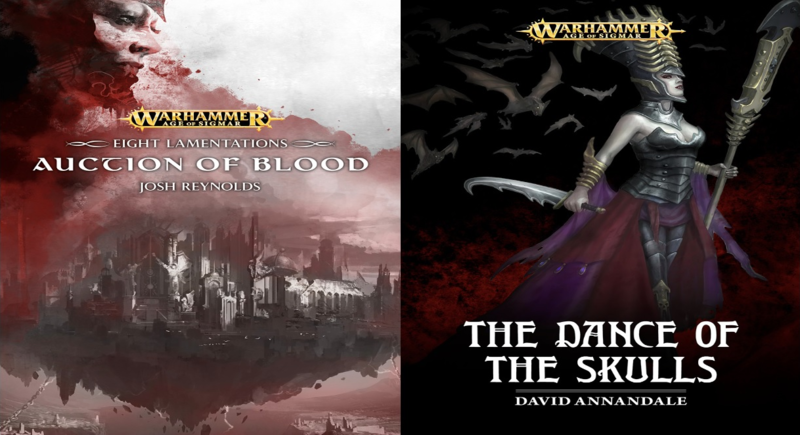 Shining Silver: A very bright silver, similar to GW Runefang Silver, but with better coverage. Plate Mail Metal: A medium silver paint, close to GW Ironbreaker, but the coverage is slightly better. My recommended highlight colour: Shining Silver. Gun Metal: A dark silver, similar to GW's Leadbelcher, but while Leadbelcher has a nuance of oily brown, Gun Metal is slightly more neutral, cooler silver. My recommended highlight colour: Plate Mail Metal. Rough Iron: unlike the paint swatch, it's not a dark silver, but more like a dark copper. 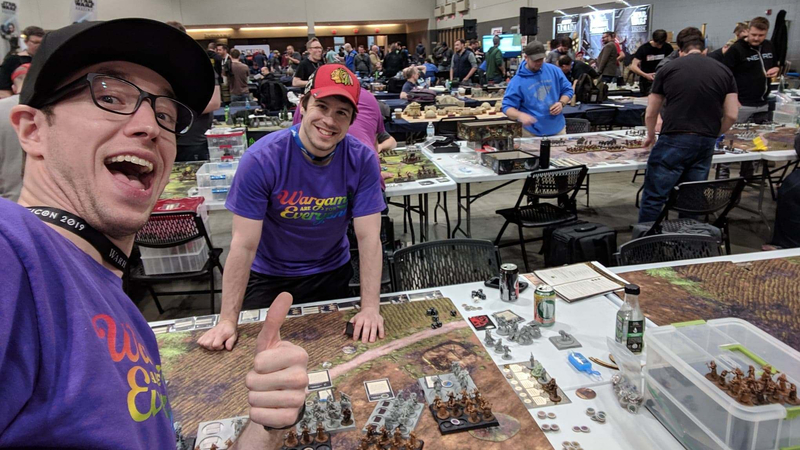 A good match for GW Warplock Bronze. The Army Painter doesn't disappoint with their Warpaints range. At almost half the price of Citadel Shades, Quickshade Inks are a winner for me. They're as good as the current Citadel Shades, if not better. These are my favourite washes out there, and if you follow my tutorials, you know how often I use them. The effect paints range has some really good varnishes and mixing mediums, again at a very competitive price point. Metallics are also good, I just wish there were more of them! 8 colours might be all what most people ever need, but I really enjoy the wealth of choices the current Citadel paint range offers. So, The Army Painter, how about some more colours, for exanple some darker and lighter brass and bronze paints, a platinum colour or an aged gold? I use whatever paints work, perfectly happy with a mix of Citadel, Valejo, Army Painter and even craft and art acrylics. The Quickshades are the best though. After Seraphim Sepia left a crusty white deposit on a Hive Tyrant wings I stopped using it. Now some will say it wasn't shaken enough,, I put on too much or it was mixed with contaminated water (even if it wasn't mixed with anything). All that could be true but whenever I've used it since and shook it relentlessly it's done the same thing. And yet I don't need to jump through any hoops with the Army Painter shades a d get the result I'm after. It's a no brainer when you add the better value in. I'm interested in the Rough Iron paint as Warplock Bronze is an amazing colour and I start most of my metallics with it but couldn't find a match for better value. Seeing lots of love lately for the Quickshades. Gonna have to cave and give them a try at some point. Great review guys! Yesterday it happend to me too… Nuln Oil left (like you mentioned) a white Crust. Army Painter Dark Tone worked like a charm. I know this. I stopped using Nuln Oil long time ago. It's really not a good product.